Cloud Computing and Virtualization are two key technologies that are likely to influence the technology scene with all might in the next 2-3 years horizon. However, there is a certain bit of confusion between what each of this means and sometimes they are almost used interchangeably (Which is not the real case). Here’s deciphering these technologies in simple terms. Virtualization is the creation of a virtual (rather than actual) version of something, such as an operating system, a server, a storage device or network resources. 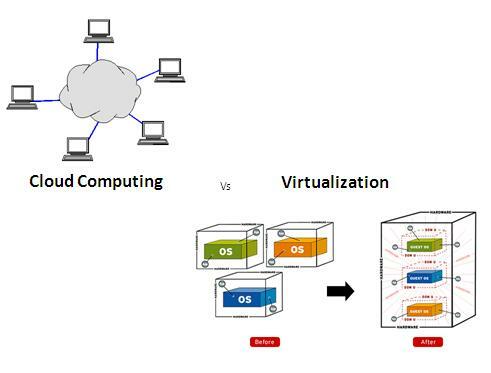 Virtualization is a computing technology that enables a single user to access multiple physical devices. This paradigm manifests itself as a single computer controlling multiple machines, or one operating system utilizing multiple computers to analyze a database. Virtualization is about creating an information technology infrastructure that leverages networking and shared physical IT assets to reduce or eliminate the need for physical computing devices dedicated to specialized tasks or systems. Virtualization is the use of virtual machines to let multiple network subscribers maintain individualized desktops on a single, centrally located computer or server. The central machine may be at a residence, business or data center. Users may be geographically scattered but are all connected to the central machine by a proprietary local area network (LAN) or wide area network (WAN) or the Internet. Cloud computing is a style of computing in which dynamically scalable and often virtualized resources are provided as a service over the Internet. Through cloud computing, a world-class data center service and collocation provider offers managed IT services through a hosted or “Software as a Service (SaaS)” model. A server or database can be physically located in a highly-secure, remote location while the data is accessed from a client’s computer, using the database’s server to retrieve, sort, and analyze the data. This arrangement eliminates the need for a costly in-house IT department and hardware and the associated capital expense. Instead, a cloud computing provider owns the hardware while providing hosted, managed services to its clients on a usage basis. Cloud computing generally utilizes virtualized IT resources such as networks, servers, and computing devices. In terms of a definition, Cloud Computing is an On-demand self-service coupled with Ubiquitous network access (internet standards based) and location independent resource pooling. Rapid elasticity (hence supply scalability and measure/metered service are the cornerstones of the Cloud Computing phenomenon. As a Platform Cloud Computing is very flexible in terms of Usage and Cost, enables to control and monitor infrastructure and services without needing to invest upfront on expensive infrastructure. Pay only for what is being used, scale up when there is a need capacity and pull it back when you don’t — all in a secure environment with over 99.9% uptime.